The Monitor 200 measures alpha, beta, gamma, and x-rays. Its digital display shows readings in your choice of CPM, CPS, µSv/hr, mR/hr, or in accumulated counts. It has a digital display, a red count light, and a beeper that sounds with each count detected. Other features include an adjustable timer, and selectable alert. With the free Observer USB Software Family, you can set computer alarms, calibrate your instrument, and download your collected data from the internal memory for easy reporting! 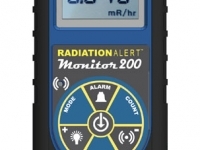 Now includes Bluetooth for use with the free Radiation Alert Observer BLE app for Android OS. The app enables users to work discretely and efficiently with their Android phone or Pad, collecting, reading, and sending data from their Radiation survey meter via text or email. The Observer BLE can record readings, take timed counts, track coordinates, and save, send, and share your surveys for easy reporting with your Radiation Alert detector. Users can perform surveys with their smartphone or help automate generating compliance reports. The Ranger offers maximum performance in a lightweight, rugged solution for surveying at the facility or in the field. The Ranger has been designed for industrial environments, but it still has all of the features you’ve come to love in the lab. 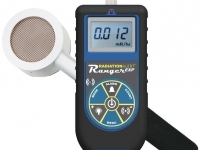 The Ranger is a small, handheld, microprocessor-based instrument which offers excellent sensitivity to low levels of alpha, beta, gamma, and x-rays. The Observer BLE can record reading, take timed counts, track coordinates, and save, send, and share your surveys for easy reporting with your Radiation Alert detector. Users can perform surveys with their smartphone or help automate generating compliance reports. The Ranger EXP offers maximum performance in a lightweight, rugged solution for using your survey meter in the field. The Ranger EXP is designed specifically for individuals operating in tough environments. The small, handheld unit offers excellent sensitivity to low levels of alpha, beta, gamma, and x-rays. The digital readout is displayed with a red count light and a beeper sounds with each count detected. Other features include an adjustable timer, selectable alert, and with the free Observer USB Software Family, you can download your collected data, set alarms, and calibrate your meter! The Observer BLE can record readings, take times counts, track coordinates, and save, send, and share your surveys for easy reporting with your Radiation Alert detector. Users can perform surveys with their smartphone or help automate generating compliance reports. 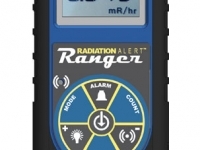 The Radiation Alert® Frisker is a radiation contamination instrument that has been designed to meet the demands of today’s radiation responder. 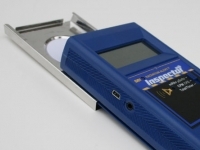 By integrating the latest electronics with a proven and dependable Geiger-Mueller detector, S.E. International has created a rugged, ergonomic tool that addresses a number of radiological applications. The stainless steel WipeTest Plate slides easily onto the SEI Inspector positioning the depression and wipe directly in front of the GM tube window at a fixed distance of 1 centimeter. The WipeTest plate is removable for general surveying. (patent#5,936,246) Many customers using the SEI Inspector Wipe Test Plate also use it as a Beta Shield for the 2-inch GM detector. (patent# 5,936,246). The Xtreme boot offers maximum performance in a lightweight rugged solution for using Radiation Alert® products in the field. The Xtreme boot is designed specifically for individuals operating in tough environments, such as 1st Responders, Mining and HAZMAT crews. 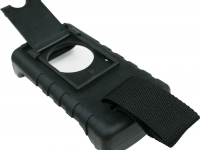 Made of a RoHS compliant TPE rubber, the case also offers superior grip and drop protection. When using the pancake detector, a protective door opens on the back of the case exposing the end window of the GM for alpha detection. 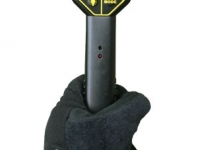 The Xtreme boot is designed for use with the Inspector Model, and Digilert Model handheld radiation detectors. 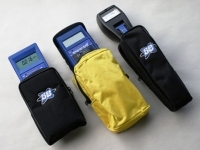 Carrying cases included with Inspector Family, Digilert Family, and Monitor 4 Family models of Radiation Alert® Detectors. URSA-II, Nomad, and Recon Carrying Cases available. Carrying cases are equipped with belt clip or belt loop. Rad-60 carrying cases are designed exclusively for use with the Rados brand 5X & 6X Series electronic dosimeters. The protective case helps to realize substantial savings on clip replacement and dosimeter repairs. Experience less down time for your in-house inventory all with a unique design that allows for the secure use on a lanyard, belt or other device. Carrying cases are equipped with a belt loop. For use with the SEI Inspector and Digilert Models. Whether you need to perform area monitoring or scan your hands and items for contamination, The Stand offers a convenient way for the instrument to stand vertically while leaving your hands free for other tasks. The Stand is made from electro-polished stainless steel. 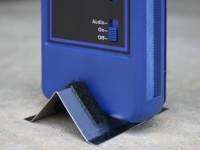 Double stick adhesive strips are included to mount The Stand in a permanent location.